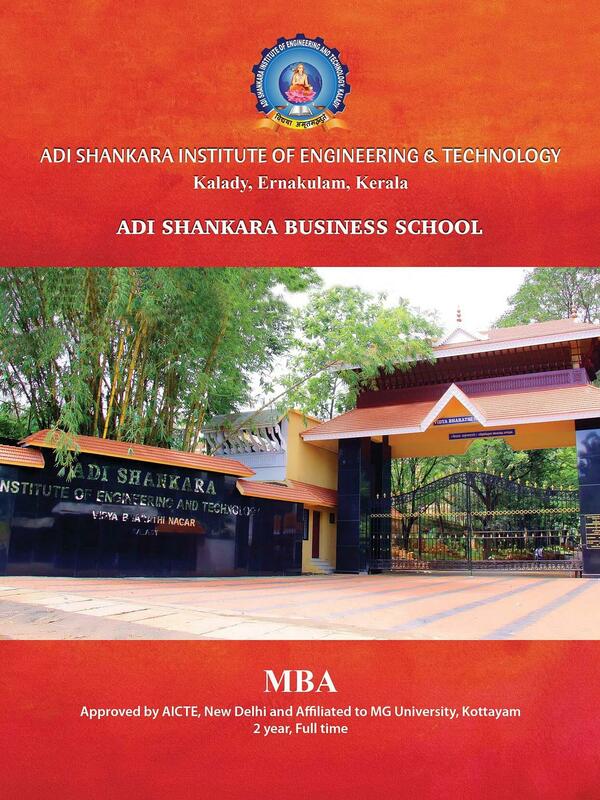 Adi Shankara Institute of Engineering Technology (ASIET), is a self-financing technical education center that was set up in 2001, in Kalady, Ernakulam (a district in Kerala). 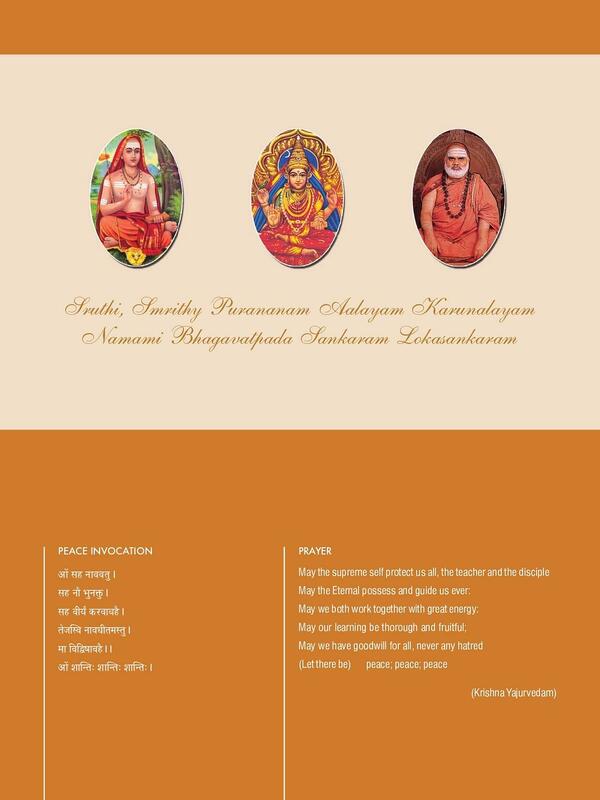 The AICTE approved Institute is managed by Adi Sankara Trust. Affiliated to MGU and AKTU, ASIET is the first technical institute to be awarded the ISO 9001: 2008 certification. 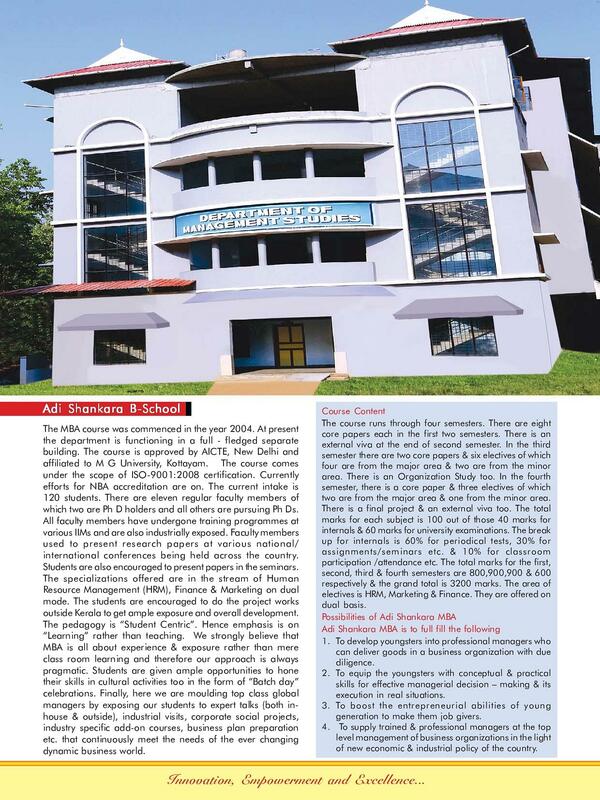 ASIET is one of the top colleges in the state of Kerala, that offers Undergraduate and Postgraduate programs in areas like Technology and Management. 1 km from Mattoor Jn. Enroute Angamaly Perumbavoor M.C. The Institute offers seven specializations in B.Tech program at the Undergraduate level and four specializations in M.Tech program at the Postgraduate level. Additionally, the institute also offers MBA program to the candidates in three specializations. ASIET offers a four-year B.Tech program in seven specializations namely, Civil Eng., Applied Electronics and Instrumentation, Mechanical Eng., Computer Science and Engineering, Electrical and Electronics Eng., Information Technology and Electronics and Communication Engineering. 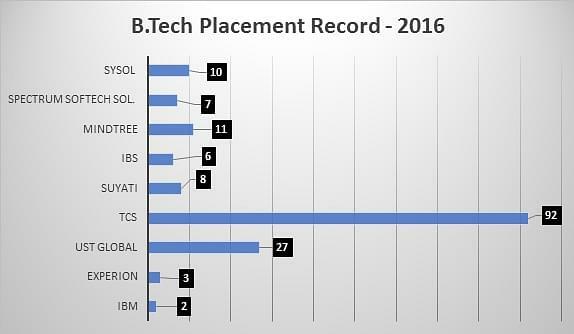 The basic qualification to apply for B.Tech program is 10+2 in Science stream from a recognized Board/ Council. The Institute offers admission to this program on the basis of marks secured in KEAM (State-level entrance exam) conducted by the Kerala Commissioner of Entrance Examinations. The 85% of seats will be allotted through KEAM counselling to GEN/ SC/ ST candidates and 15% seats will be distributed by management committee to NRI category. Candidates belonging to NRI category will be exempted from the entrance examination and their selection will be done on the basis of their previous academic scores. The college offers M.Tech program at the PG level in four specializations – Computer Science and Engineering, VLSI and Embedded Systems, Power Electronics and Power Systems, and Communication Engineering. For those applying to this program, acquiring minimum 50% in Bachelors (B.Tech/ BE) is mandatory. Candidates will be shortlisted on the basis of the marks secured in Bachelors and GATE entrance exam. Shortlisted candidates will then be selected through counselling conducted by DTE Trivandrum. Students applying to M.Tech program must have a minimum three-year professional experience in the relevant field. ASIET offers three specializations to the candidates under MBA program viz, Human Resource Management, Marketing Management, and Finance. The students applying to this program must possess a Bachelors degree in any stream with a background in Computer and minimum 50% marks overall. It is compulsory to hold a valid CMAT/ CAT score to apply for MBA program. Candidates will be selected according to their performance in Academics, CAT/ CMAT Entrance exam, GD and PI rounds. The Placement cell of ASIET is constituted to provide the right perspective regarding the various career options available to the students and sufficiently train them to choose and pursue their careers of choice. Students are placed for practical training in various establishments according to their area of Interest and specialization. First New Generation Engineering College to get ISO 9001:2000 Certification. First self-financing college to implement Campus Connect soft skill program partnering with Infosys. First Self-Financing Engineering College to be visited by President of India for interaction with the students. First self-financing colleges in Kerala to get special recognition from CMD of Brahmos-Dr. A. S. Pillai, CEO of Infosys, Dr. Shibulal to the projects done by engineering students of Adi Shankara. More than 20 innovative projects sponsored by Technology Incubation Centre for achieving patents. Awarded the status of Active Centre by Infosys and Shriram Group of Companies. First new generation Engineering college which provides IQ Lab training, Logic Puzzle Training, online Aptitude & Technical training module from third semester onwards to enhance the Logic and Reasoning skills, Computational skills, Comprehensive skills, Conceptual skills etc. First New Generation Engineering College to conduct National level Technical Festival every year, right from the start collaborating with prominent industries. One among the few Engineering Colleges having a tie-up with Infosys for campus connect initiative. Scholarships are provided for meritorious as well as economically backward students. Students with high ranks in the Kerala State Entrance Exam will be given 100% tuition fee as scholarship. 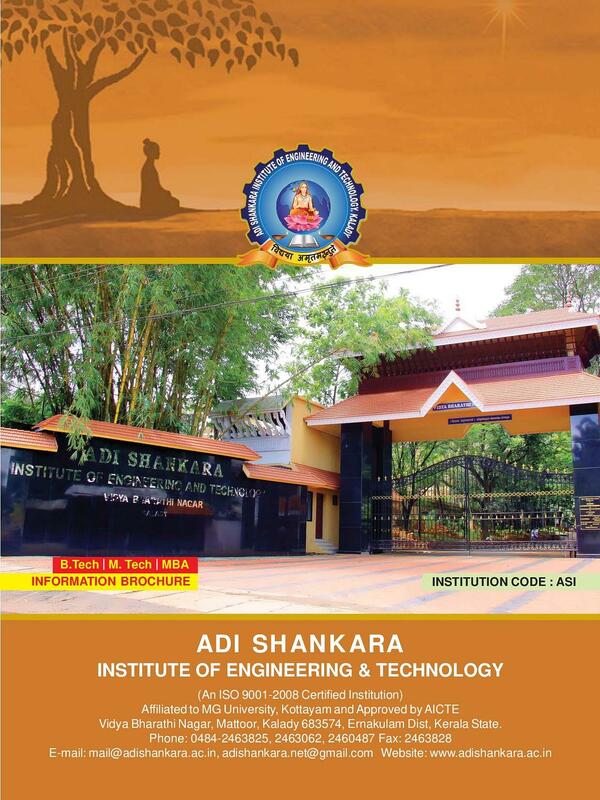 Why Join Adi Shankara Institute of Engineering Technology? The institute strives to provide value-added education with a flair for professional excellence and commitment to society. The institution is ISO certified and accredited by several professional agencies like KPMG, which puts them among the branded names in higher education. With placement record of 75%, the institution witnesses a heavy inflow of students from in and around Kerala. The vision of the Institute is to emerge as a Center of Excellence in Engineering, Technology, and Management by imparting quality education, Focusing on empowerment and innovation. The entire focus of education is on instilling qualities of self-reliance, courage, self-confidence, and self-esteem in the students. 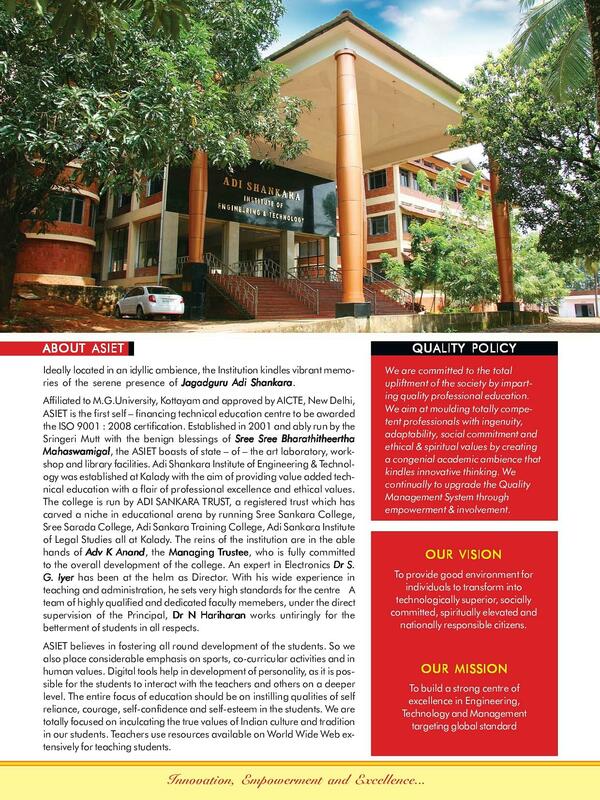 The mission of ASIET is to impart quality professional education for the total upliftment of the society. Create a congenial academic ambiance that kindles innovative thinking and research. Mould competent professionals who are socially committed and responsible citizens. This is the best management I have ever been under. They are very efficient and helpful. 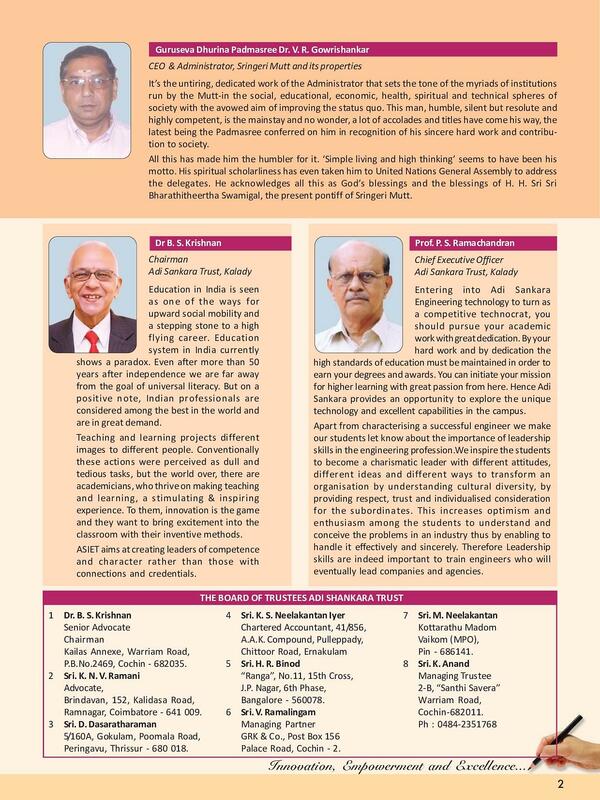 The management panel consists of highly educated personalities. 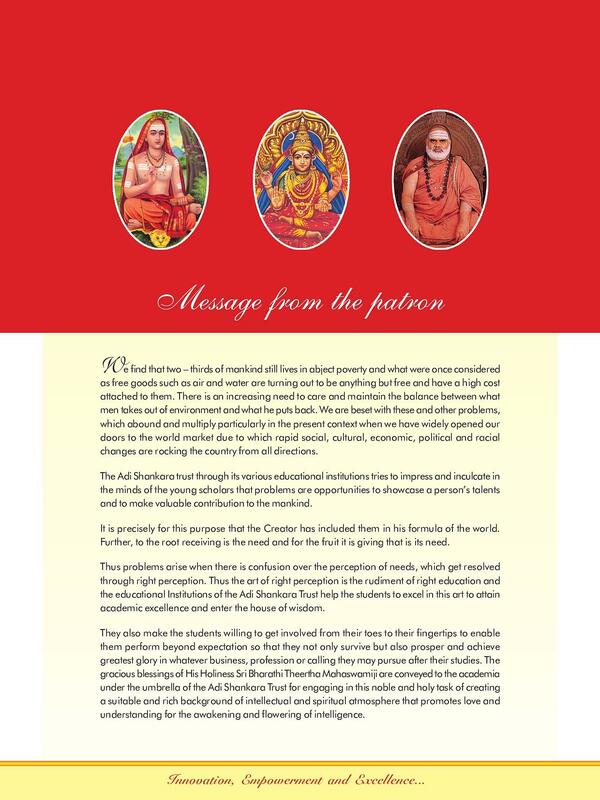 They workout maximum to solve students problems and the welfare of the college. A place that supports and promotes one's ideas and encourages one for more creativity. 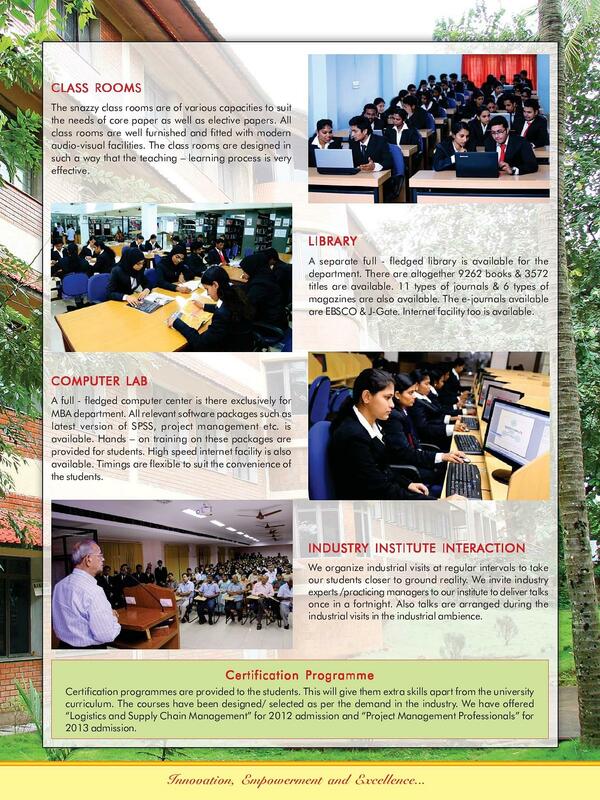 The college is an excellent place for boosting one's knowledge about various aspects. One of the well known managements in the state. My two year of experience is satisfactory. 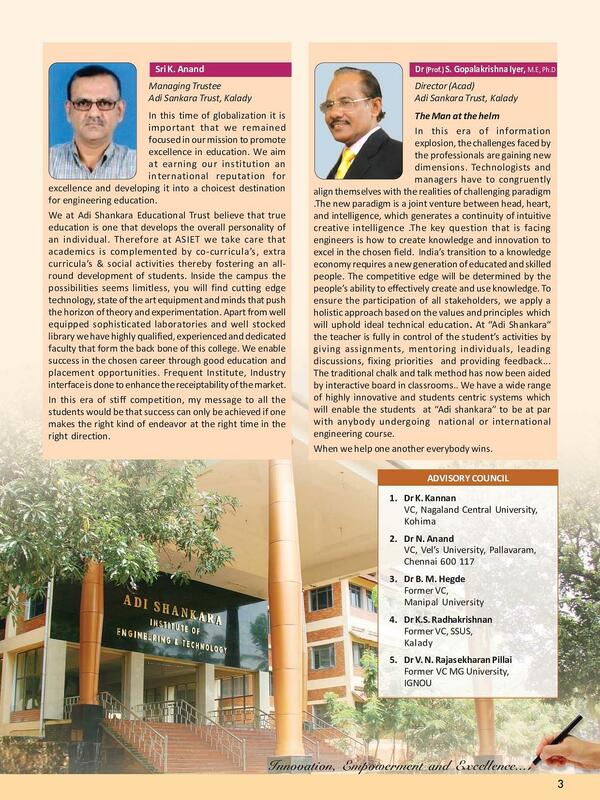 As ASIET i am proud to do my course on Kerala's first self financing college. Its a awesome college for me to deal with. They should provide more awareness sessions to students. There not much to tell about the goods and bads of the colleage. Only thing is that the campus is small campus but a peaceful atmoshpere outside the building. "A place that supports and promotes one's ideas and encourages one for more creativity." Wrote the Kerala Entrance. Landed up in the Management quota. Yes, there was an interview. I chose the course out of my ambition. "Awesome college to deal with"
I took the admission on state merit basis. The college authorities have a nice interview session before admission process .They described about various courses offered by the college. And I finally took EEE course which was suitable for me. I got a rank of 7910 in Kerala entrance, and based on my preference list, this college was selected.